1. Which statement best describes the main idea of this cartoon? 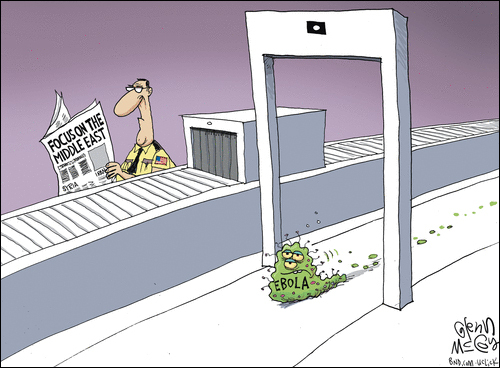 a) no one was able to see the Ebola virus coming to the U.S.
b) if we don’t ban all flights from West Africa, the Ebola virus will spread in the U.S.
d) a TSA agent who was not doing his job allowed the Ebola virus to enter the U.S.
2. Editorial cartoonists often use humor to make light of serious situations. One of the types of humor they use is irony. Irony is defined as when the opposite of what you expect to happen occurs. Describe the irony in this cartoon. 2. You expect that death threats will be brought into the U.S. through ISIS terrorists but instead the even bigger, more likely threat to the lives of a much greater number of Americans is a disease that is out of control in West Africa.